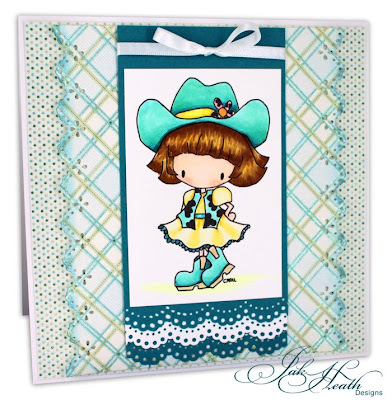 This little Peach is called Annie's Hat by Tiddlyinks and she's a real cutie in her cowgirl gear I know a few line dances that would love this on their card. Coloured with copic markers and teamed with DCWV papers fancy edges done with martha Stewart punches and a bit of love to bring it all together. She REALLY is adorable Jak! ... and as always your coloring rocks! I love it, she is really cute! I love the design. Such a cute image and your colour matching is absolutely fantasic Jak. Gorgeous card. A Real cutie my SIL still line dances and she is in her 70's. love the use of the MS punches and colours youve used. Ah she is IRRESISTIBLE! Fabulous card Jak. Just wish I could colour like you - and I love how you have matted and layered the image - top class. Absolute adorable Jak..love the coloured doiley lace as I could imagin it as being part of the hem of her dress. Gorgeous.